Sometimes I like to daydream about owning a taco truck and driving around town making people homemade breakfast and lunch. My partner in crime would be my father in law, Big Stew. He is accustomed to cooking for an “army”, and has no problem waking up before the sun to get his day started. All the ingredients would be organic, and bought from fair trade and local farmers. The food would be unique and, of course, absolutely delicious. I would cruise around to office buildings, and offer up crispy black bean tacos, veggie sandwiches and homemade soup. I think Vegas needs something like that. Plus it would be a blast to whip around town in a big silver truck feeding people and singing to The Be Good Tanyas with my father in law. I also love the idea of serving breakfast from a truck, with fresh organic coffee, delicious homemade pastries, and seasonal pancakes made to order. 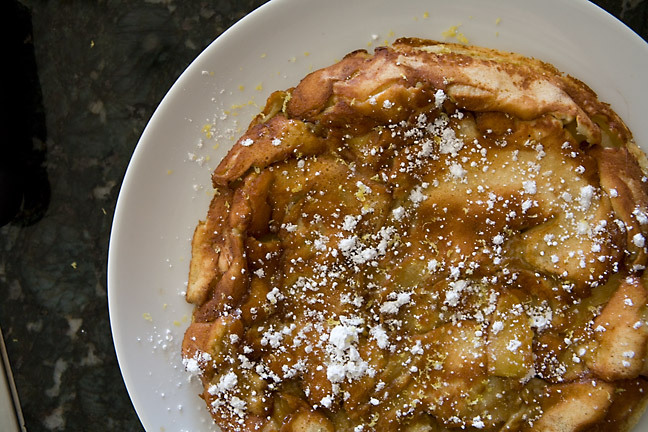 But until I have my taco truck (fingers crossed Santa will bring me one this year) I will savor my Sunday morning breakfasts on the couch in my PJs, with an oven-baked apple pancake and a “small-ish” bowl of powdered sugar. This is truly the king of all pancakes. 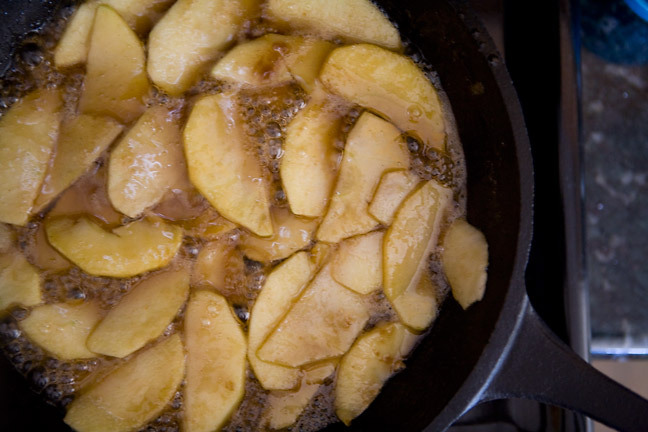 It’s light and airy and packed with apples that simmered in butter, brown sugar and cinnamon. When baked, the apples get chewy and stick to your teeth a little – my favorite part. Finished with lemon zest and a sprinkle (or in my case a spoonful) of powdered sugar, it’s to die for. Apples are in peak season right now so it’s a good time to take advantage of them. Pick ones that are slightly sweet. You’ll need to peel and core the apple. My trick is to hold your peeler like a paring knife and start at the top of the apple peeling in one motion as you rotate the apple in your hand. You’ll be done in no time. I also highly recommend using Penzey’s cinnamon if you are in the market for new cinnamon. It has so much more flavor and kick to it than what you’ll normally find in the market. Combine this with butter, brown sugar and thinly sliced apples and you are on your way to discovering breakfast bliss. The next step requires that you dump eggs, milk, flour and dash of salt in the blender. 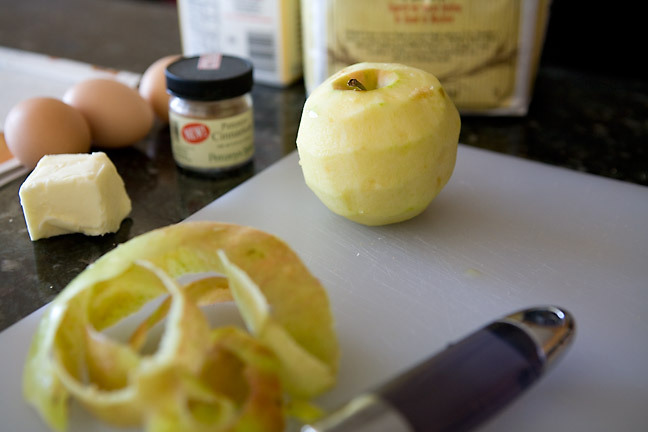 Whiz them together and slowly pour the mixture into your skillet of tender slightly browned apples. Put your skillet directly in the oven and in 15 minutes you’ll have a puffed up pancake and apples that have caramelized. Add your lemon zest to brighten your palette and serve immediately. If you aren’t much of breakfast person, this dish would also serve well as a dessert with a scoop of ice cream. Enjoy! This recipe came from Sunset Magazine. It was perfect as is – no need to adjust. apple and cook until just starting to soften, about 3 minutes. 15 minutes. Sprinkle with lemon juice and powdered sugar. « A Recipe 2 Months in the Making. Please, please, please Santa, bring Chassie the taco truck for Christmas this year. I would visit it EVERY DAY to enjoy wonderful organic, healthy & yummy food prepared by her & Stew. The choices we have in downtown LV are sooo bad, Santa. Please?? You are so sweet Lori!! I can’t wait to try this recipe on our guests..I will let you know how it goes!